We are a full time, fully insured, professional disc jockey company that customizes your event. 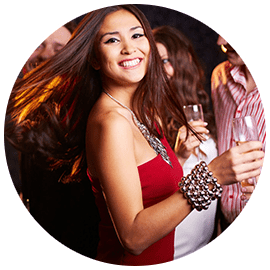 We offer an extensive music selection, state of the art lighting, photo booth, video, photography, Karaoke and equipment, choice of one or two DJ / MC format's, with optional request cards or party favors. 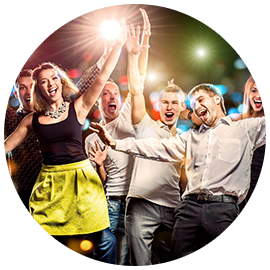 3D Disc Jockeys with over 15 years’ experience guarantee's memories for a lifetime! Where satisfaction is our top priority! 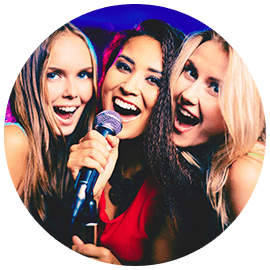 Experience, Integrity, Knowledgeable, Exciting, Cutting Edge, Your one stop Disc Jockey Company, featuring our full service you say it we play it experience! Birthday Parties, Bridal Showers, Corporate Entertainment/Media, Fundraisers, Game Shows, Grade School and High School Events, Children’s Parties, Anniversaries, Holiday Parties, Master of Ceremonies, Photo booth, Videos, Portraits, Photography, Retirement Parties, Wedding Ceremony and Wedding Receptions. We would like to thank you for the wonderful evening and your choice of music at our annual Holiday Party. We enjoyed your leadership in teaching us all the dances. We just wanted to thank 3D Disc Jockeys for the huge success for our wedding. The DJs played everything from oldies to today’s music and got everyone on the dance floor. Thank you again and we will see you at our friend’s upcoming wedding. I just wanted to thank you for a job well done at my party. My dad, who is very hard to please, has talked to everyone about how good you are and that’s a compliment coming from him. The party was a dream come true because of your willingness to work with me and my family. Thanks for making the night a success. Thank you so much for helping to make our wedding day perfect. The DJs who worked at our wedding were wonderful and everyone had a great time. As coordinator of my companys Holiday Party, I would like to extend sincere thanks and appreciation to you and your company. The party was truly a SUCCESS. It was the largest turn out and everyone was extremely pleased with your music and song selections. I have received nothing but rave reviews from our guests and employees. You really know how to work the crowd and that is exactly what they needed and wanted. The request cards you placed on the tables went over very well and you played music that appealed to all. A big thanks and looking forward to partying again next year. We just wanted to send a thank you to you and your DJs for the excellent job you did at our wedding. Everyone had a great time and it was nonstop dancing all night. If anyone is in need of a DJ, we definitely will refer you and your company. Again our sincere thanks. Thanks so much for the wonderful music you provided at my surprise birthday party. Everyone raved about you guys, so thanks again for making my party so special. Thank you so much for doing a great job and making our wedding day a wonderful memory. I wanted to extend to you our thanks for your help with our parents 50th wedding anniversary party. The compliments on your work and skill in getting people onto the dance floor was amazing. Thank you again. Thank you very much for your outstanding service at our wedding. You did a great job as our master of ceremonies and your DJ played exactly what we wanted. The whole night was a success and it ran so smoothly. Again, we are so happy that we selected you as our DJ. Feel free to use us as a referral! On behalf of the reunion committee, we would like to thank you for making our reunion a success. The songs were great and the volume was just the right level. The classmates all enjoyed themselves. Thank you again. Thank you and your staff for a wonderful job at the Father/Daughter Dance. The children and their fathers had a wonderful time. I wanted to thank you for making my husband’s birthday party a very special day. All the guests said what great music was played. Looking forward to our next party. I just wanted to say thank you for making our oldies dance a great success. You made the night memorable and we look forward to having you again next year. Thank you so much an extraordinary job as our DJ at our wedding. You were great with the kids and saw to it that everything ran smoothly. Everyone enjoyed themselves thanks to you. We would like to thank you for all you did to make our wedding day special. Thank you so much for making our 50th wedding anniversary celebration such a big success. Everyone loved your music and you kept all happy and dancing all night. Many thanks. I simply cannot thank you enough for the fantastic evening of entertainment that you provided for us on Saturday. Everyone had a wonderful time. I have not felt as energized and joyful as I did last night in a long time. Your music choices were perfect and you found a way to get everyone involved. I just wanted to drop a line thanking you for a great job. You helped make our party a great success and most of all fun. You’re a real pro. Just wanted to express my appreciation for making the party such a wonderful day. You are by far the best DJ I have ever heard and once again my sincere thanks for all your help. Please accept our sincere thanks for a job done incredibly well. You made our wedding reception one to remember over and over again. So many of our family and friends told us how great the DJs were and the selection of music. Thank you so much for helping make my children’s Communion party a huge success. We all had a wonderful time. Cameron, Danielle, Andrea and Dawn C.
I wanted to thank you again for making the party a huge hit. We really appreciated your patience dealing with us and cannot believe that you were able to get those people up to dance. Lou & I want to thank you for your help in making our wedding a day to remember. The DJ’s did a great job making sure that everyone was having fun. We’ll be sure to recommend 3D Disc Jockeys to all our family and friends. Thank you so much for the wonderful job you did at our wedding. We all had a great time. Everyone’s been complimenting us on our choice of DJs. On behalf of the R.V. Fire Department, we would like to thank you so much for your services. The music was excellent and all had a good time. Thank you for doing such a great job at our wedding. Our guests and ourselves were so impressed on how you “get it done” professionally. The choice of music was beyond compare and everyone danced all night. We would not hesitate to recommend your company. © 2018, 3D Disc Jockeys. All Rights Reserved.